Who will answer the call? Has the Station 19 TV show been cancelled or renewed for a second season on ABC? The television vulture is watching all the latest cancellation and renewal news, so this page is the place to track the status of Station 19, season two. Bookmark it, or subscribe for the latest updates. Remember, the television vulture is watching your shows. Are you? An ABC action drama from creator Stacy McKee, Station 19 is a spin-off of Shondaland’s Grey’s Anatomy, starring Jaina Lee Ortiz, Jason George, Grey Damon, Barrett Doss, Alberto Frezza, Jay Hayden, Okieriete Onaodowan, Danielle Savre, and Miguel Sandoval. The story centers on the firefighter-EMTs of Seattle’s Station 19 — the best of the best. Thanks to close quarters, and the nature of the job, over the course of their 24-hour shifts, the team at Station 19 have grown into a family. The roots of their relationships run deep, and not all of the action they see takes place on the streets. 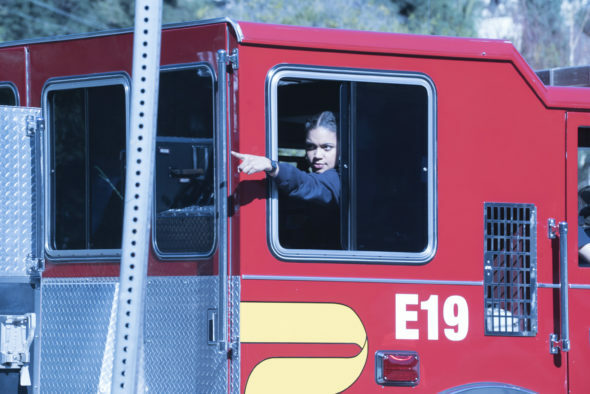 The first season of Station 19 averaged a 1.05 rating in the 18-49 demographic and 5.27 million viewers. Find out how Station 19 stacks up against other ABC TV shows. Station 19 has been renewed for a second season which will debut October 4, 2018. Stay tuned for further updates. Will ABC cancel or renew Station 19 for season two? The ratings haven’t been great but I think they’ll renew it. Grey’s Anatomy has to end, someday, and the Alphabet Network needs something to replace its top drama. If Station 19 needs tweaking, retooling, or whatever, they’ll do what it takes. Since this is all speculation, I’ll keep a hungry eye on the ratings and update this page with breaking developments. Subscribe for free alerts on Station 19 cancellation or renewal news. 5/11/18 update: ABC has renewed Station 19 for a second season. Details here. TV show ratings are still important. Follow Station 19‘s weekly ups and downs. Find more Station 19 TV series news or other ABC TV show news. What do you think? Are you glad that the Station 19 TV show has been renewed for a second season? How would you feel if ABC had cancelled this TV series, instead? TAKE THIS SHOW OFF THE AIR! Firefighters don’t act this way.